Baler is known as a surfer's haven. People usually flock here during the months of November to April to ride the gigantic waves at Sabang beach. While the waves may not be as humongous as the ones in Siargao, people seem to still enjoy surfing at the black beach. But more than surfing, Baler has a million of things to offer. During our stay at the newly-opened Costa Pacifica Raintree in Sabang, we had the chance to discover the beauty of the once sleepy town of Baler. We started our quest within the resort, so have a look at the myriad of things you can do while at Costa Pacifica Raintree. Believe, no dull moment here. If you want to just laze around and have some refreshing drinks or cocktails, choose a table by the poolside. The sound of the swaying trees and the sea will definitely lure you to sleep. Plus, there is complimentary WiFi there, so you surf the net, update your FB status and Instagram all you want while enjoying the stunning view. Coconut is abundant in Baler, so at the Beach House, do not be surprised if you see a jug of fresh coconut water at the breakfast buffet. Enjoy different buko concoctions like buko lychee smoothie and fresh buko juice complete with its shell. At lunch or dinner, enjoy a warm bowl of chicken binakol -- a native chicken soup made of coconut water, of course. It tends to get really hot at noon time in Baler, and what other way to beat the heat but to have a dip at the infinity pool. The pool is huge and has varying depth. Kids can enjoy here, too! And if you got tired of swimming, why not grab a book and lounge at the poolside. Sun bathe if you wish, or grab a complimentary glass of lemon-infused water. Other than buko, Baler is also abundant in pako (fern). Randy, the resort manager said that it is cheaper than other common vegetables like kang-kong and camote tops because there are lots of supply from local farms. So, at Costa Pacifica Raintree, they made different dishes out of this local ingredient. They have pako salad to start with, pako spring rolls, pako pizza, and the list goes on. So vegans and non-vegans alike, make sure to sample these dishes when you're in Baler. While the sand at Sabang beach is totally black, it is without a doubt the finest black sand I've ever seen. I could walk barefoot there without hurting my feet. I am not a big fan of black beaches I must admit, but this one is an exemption. Think of the fineness of the sand in Boracay, and turn it into dark gray. That's how it is. You can just stroll along the boardwalk that connects the entire strip or just sit on the sand and watch surfers playing around. The waves are not too strong when we went there so it is conducive for swimming. Hey, you're in Baler, so better try surfing! No need to worry if you're a first-timer. There are guides who'll be patient enough to take care of you. There are lots of people who go here just to try out surfing even if they don't have any idea about the sport. They call it "lifestyle surfing." Rates here are cheaper. But pros are also welcome (hello, Jericho Rosales is a regular guest here). Lesson rates starts at Php 300. Do you want to see how many people are trying to learn how to surf in Sabang? Here, take a look! Oh, by the way, it's off peak season. If you love dipping your suman in sugar or chocolate sauce, I am sure you will love it in Nanay Pacing's peanut butter and coco jam. It's heavenly. The peanut butter is not too oily yet still tastes like local peanut butter (for the record, I am not keen of imported peanut butters. I find it dry and too artificial). The coco jam is divine as it is not too sweet. I can eat it alone. Goodbye cookie butter! Oh, and make sure you bring home a bottle. It's worth it. Whether from inside your room or in your own garden, make sure you get up at around 5:00 am to catch the beautiful sunrise at Costa Pacifica Raintree. 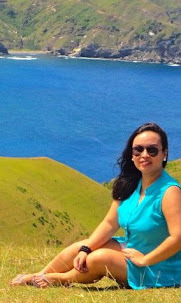 The best spot to see it is at the guard's post, where you can also see Diguisit beach from afar. If you don't have time to go out of the resort to buy some souvenirs, the resort has its own boutique where you can buy shirts, sabutan bags, mats and hats, as well as some wooden ladles. Sabutan is a kind of weave that comes from a pandan-like plant that grows in the forests of Baler. If you love Bicol's abaca, you'll definitely adore sabutan products. These are just some of the things that you can do at Costa Pacifica Raintree. You can also have a massage at your room should you wish. On my next post, I'll share what we had discovered around Baler and the nearby towns of San Luis and Maria Aurora, so stay tuned!